Ecurie Rossignol Ltd (see ‘Before Minis’) was keen to augment the sales of its Alexander conversion kits for engines and Ken Nightingale thought that there was a market for car body conversions as well as engine conversions. 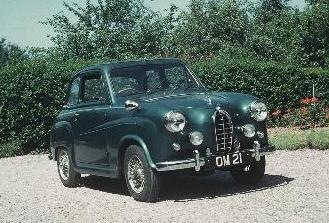 In the late 1950s, the basic Austin A35 was quite a nippy little car even before it had an Alexander conversion. One was obtained and fitted with various engine tweaks including a Weber carburettor. It was given a sloping back and a special grill, partly modelled on the Bugatti grille, probably because of Ken Nightingale’s association with the Bugatti Owners Club (he was Secretary and Treasurer). The Bugatti Owners Club own Prescott Hill Climb in Gloucestershire. Wire wheels, dark blue metallic paint and well-padded leather seats completed the conversion of the A35. The overall effect made the car look like a small Alfa Romeo, albeit slightly out of proportion in terms of being taller and less wide than the expected profile of an Alfa. Any thoughts of selling this body conversion stopped when the Mini (Austin 7 and Morris Mini Minor) were launched in the Autumn of 1959.